No, this is not a tribute to Earth Crisis's EP, nor does it have any connection to the defunct US Christian metalcorers. These 9 instrumental tracks for over 31 minutes are unreleased and come from the pen and the guitar of the Brazilian shredder Carlos Lichman. Although his self-declared influences are Jason Becker, Marty Friedman (particularly in "Shred Dogs", which sounds like an excerpt from "Holy Wars"), Tony Macalpine, Francesco Fareri, Impellitteri, Rusty Cooley, Stephan Forte, Marcos De Ros, Kiko Loureiro, Richie Kotzen, Vinnie Moore, Steve Vai (especially in "Just Rock it"), Sergio Buss, Vitalij Kuprij, Michael Angelo, Edison Avila, John Petrucci, Edu Ardanuy, Joe Stump, Theodore Ziras, Shawn Lane, George Bellas and Tom Hess, it is also necessary do add the list Yngwie Malmsteen and Overkill's Bobby Gustafson among the others; pay attention to the similarities of the latter in the use of the plectrum, as well as the bending, tapping, picking performances and finally the rhythmics and the licks that the Carioca axeman often chooses to use, and you'll agree. 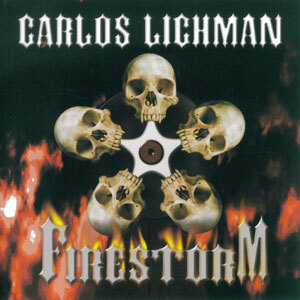 This powerful concentrate of Technical metal also sees the partecipation of important guest guitar heroes, Angra's Kiko Loureiro, Pablo Soler from Argentina, Francesco Fareri from Italy and US jazz/fusion virtuoso Jim Horna, and proves that Mr. Lichman has a skill and a background confirming he is ready to play back in a real band after Neverland's demise and not only a project with session musicians, be it a Thrash metal outfit, a Power metal combo, a Progressive Metal act or a Classic heavy one. He can be fast, but he also knows when it's time to work on a note and how to give it a meaning that way and in that moment, without forgetting that he has a good taste in choosing the sounds and he obtained a professional, clean and rather heavy production. Is everything devoid of faults then? A smart question whose answer is no, since there are a few aspects that might be improved a little: a more various and imaginative drumwork is preferred in tracks like "Endless"; this can be explained by the fact that the whole record was written by the guitarist, but next time he'd better leave the skinbeater more room for their ideas, the way it happens here in "Intense Guitar Playing" for instance; after all, 4 ears hear better than 2 and more appreciable contributions can come from someone who's been drumming for years; even a minimal variation in a pattern or the nuance of a second can enhance the feeling of a composition beyond belief. 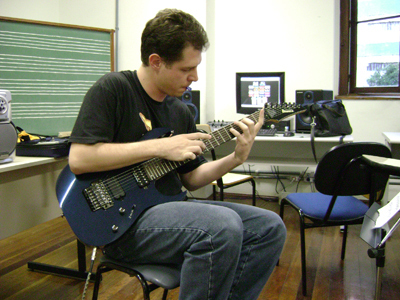 There are also a couple of songs with keyboards that have no reason to exist, as they are played in a manner that only piano bar or wedding bands would; however, nothing is perfect from the beginning, so let's give the south American Rock/Metal (and even a bit bluesy) guitar player time to improve the arrangement phase before the sophomore full-length release, recommending him to look at "Drug Dealers" as a pattern of really successful songwriting, a song complete and beautiful from every point of view. Not that bad of a debut nevertheless. He also recorded a guest solo in the project "O Solo é SEu" from brazilian Guitar Player Magazine.